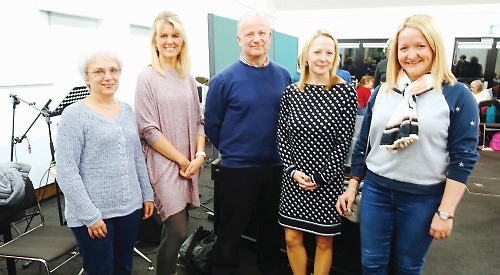 HENLEY’S top homegrown singers will be stepping forward next Saturday (December 8) when the town’s choral society and youth choirs host their annual Christmas concerts at St Mary’s Church in Hart Street. A family Christmas concert at 2.30pm will be followed at 7pm by “A Ceremony of Carols”. Both concerts will feature choral Christmas works by Benjamin Britten, accompanied by the acclaimed harpist Mary Reid, who will also perform harp solos with a seasonal theme during the afternoon and evening events. The 2.30pm performance will see the youth choirs’ new musical director Jessica Norton make her Henley concert debut. As the title indicates, the 7pm concert conducted by Henley Choral Society musical director Peter Asprey will showcase Britten’s A Ceremony of Carols. While previous concerts have featured invited soloists, Sunday evening’s solos will be performed by members of the choir — sopranos Emma Beesley, Fi Harding and Melissa Marple, alto Kathy Munns, and tenor David Lewis. Henley Choral Society chair Susan Edwards said: “Peter has put together a magical programme of concerts that will leave you tingling and excited for the Christmas season. I am particularly thrilled to have the harp accompanying both choirs, as well as talented soloists who have been drawn from our soprano, alto and tenor sections. Tickets for the afternoon concert are £12 for adults and £5 for children under 18, with family tickets £30. Tickets for the evening concert are £15 for adults and £5 for under-18s as above. To purchase tickets in person, call in to Gorvett & Stone at 21 Duke Street, Henley.